Bob Brewer looks at the growing trend of packaging craft beer in cans. Beer in cans has been around for a long time. Starting shortly after the repeal of prohibition, American breweries began experimenting with the idea as a way to replace the glass bottle as the primary package for beer – a concept fully endorsed by the steel industry, no doubt. 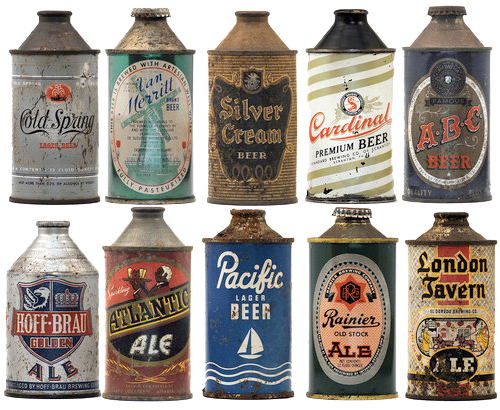 Early beer cans were designed to be filled the same as bottles and were constructed with a conical top that had an opening that used a standard bottle cap closure. 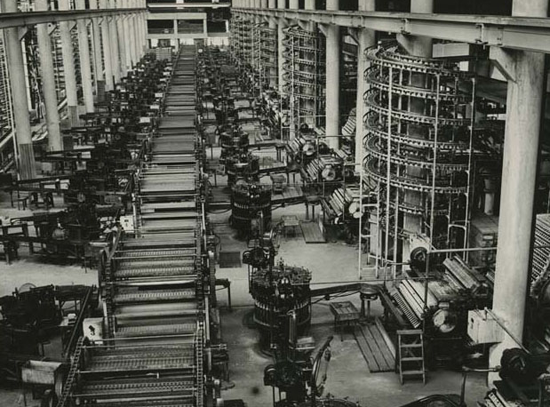 As technology advanced, specialty can-filling machinery was developed that ran at high speeds and featured a crimped on top that required an opener to puncture the top of the can. 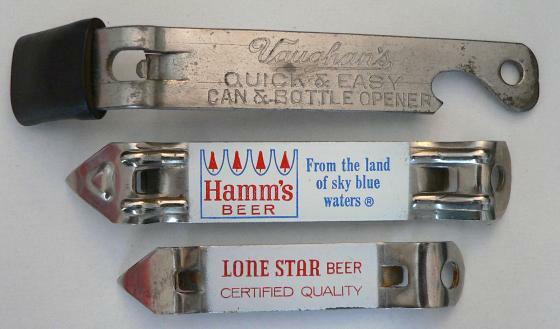 I think we all remember the beer can opener or “church key”. Well, some of us, anyway. Cans had a lot of advantages for brewers at the time. They were cheaper to manufacture and were lighter than glass. They protected the beer from light, could be filled at much higher rates of speed, and traveled well with minimum breakage. Better yet, beer cans were a no deposit, throwaway container while glass bottles were still being refilled. As the can became the preferred retail container, glass manufacturers countered with a cheaper and lighter bottle that could be cost effective as a no-return item, especially when the expense of transporting and washing a returnable was factored in. There was also some not-so-subtle propaganda put forth that promoted glass over the can as a quality and flavor issue. Glass still was used extensively however, and to some degree held the perception of higher quality than cans. Premium beer always came in bottles, as did imports. Bar patrons seemed to prefer bottles as well. 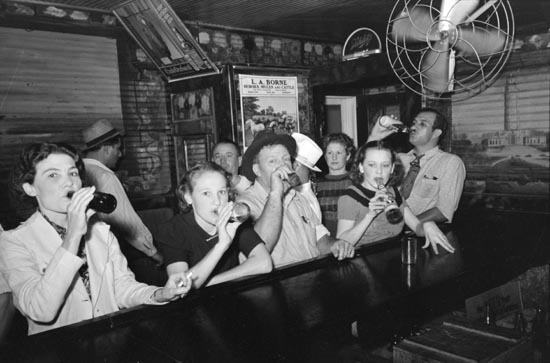 Post-prohibition beer drinkers enjoying bottled beer. Photo: Russell Lee via wikipedia.org. An unintended consequence of the “no deposit, no return,” can versus bottle era was an exponential increase in roadside litter. When someone complained about litter, it was always the beer can that was mentioned. It was the “loutish can consumer” that drank while driving and threw the empty out of the car (or pickup truck) window, not the “more responsible and sophisticated bottle consumer.” There were plenty of bottles in the ditch, too, but cans were considered the culprit. The beer can started to redeem itself somewhat as a result of two separate but related happenstances. First, the state of Oregon imposed a deposit on all beverage containers which made it worthwhile to recycle them. Not only did people save their cans and bottles, but discarded containers were quickly picked up by scavengers for their deposit value. This deposit law was so successful in eliminating the litter problem that it was copied by many other states in short order. Second, the scrap value of aluminum, which had become the metal of choice for beer cans, became so high that it sometimes exceeded the deposit value. Cans became cool because of their recyclability as eco-awareness took hold around the country. Somehow the perceived quality issue persisted, though. In some people’s minds there was a difference between Joe Sixpack sitting on the tailgate of his pickup with his dog, having a can of beer and Joe Cool sitting in a hip environment with a nice looking gal, having a bottle of some premium or imported beer. Beer ads never showed a woman holding a can unless she was fetching it for the guy. Sometimes the dog even fetched the beer. Personally, I would have rather been with both my dog and the gal. And the pickup too, at which point the beer container wouldn’t matter. Something changed a few years ago. Craft beer has been a predominately bottled product. In the beginning, this was probably not so much because of the quality perception, but more simply because there were no small-scale can fillers around. Big breweries could afford huge, impossibly fast canning lines and craft brewers didn’t brew to the scale that justified the investment. Manufacturers of these mega-machines saw no market for smaller versions and didn’t invest in engineering them. Bottle fillers were, on the other hand, all over the place. Lots of small, slower, low-tech units were available. Bottles could even be filled by hand, as most home brewers do. As the craft industry grew, the bottle was the preferred package. But, as I said, something changed a few years ago, and craft beer started to show up in cans. Again, there are a couple of reasons. First, as I mentioned earlier, cans have become cool. Not only from a recyclability standpoint, but from a kind of retro beer resurgence as well. A few old brands have come back in cans as the “hipster” alternative to mega-brewery beers. Second, you can take a can where bottles aren’t allowed or aren’t the best choice because of the breakability problem – outdoor areas like state and national parks for one. Pools, golf courses, hiking, boating, fishing, camping, and yes, even pickup truck tailgates, are others. Cans travel well in the backpack that everybody seems to be toting around these days, and they’re lighter so you can carry more. You can even fit more into your cooler. And what’s more hip than craft beer? Enterprising folks in the craft industry have engineered small-scale canning lines themselves. Small industries are stepping up as well. 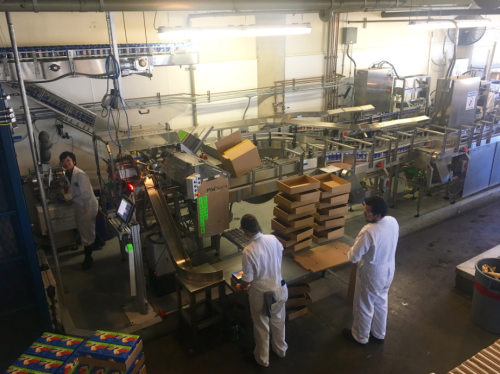 Contract canners with transportable machinery are offering their services, and let’s face it, the overall can market is huge and offers growth opportunities beyond just kegs and bottles. There are now a number of craft breweries that offer only cans. This is a trend that will continue to grow as craft brewers compete more directly with the larger beer companies. 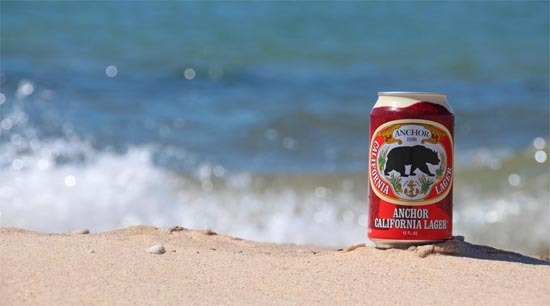 Not to be left too far behind, Anchor Brewing started canning in 2014, releasing Anchor California Lager in 12-ounce cans. Since then Anchor has released many more varieties in cans including Go West! IPA, Liberty Ale, Meyer Lemon Lager, Mango Wheat, Blood Orange Blonde, Los Gigantes Lager, Anchor Summer Wheat, and Brotherhood Steam Beer. Bottles will continue to be the package of choice for craft brewers for the foreseeable future, but craft cans will continue to grow as consumer interest builds and more brewers enter the market. Use our Beer Finder to search for Anchor brews in cans – and bottles – near you! Note: This post was updated in July of 2017 to reflect additional Anchor brews available in cans. I would love original Anchor Steam in a can!!! Right now the California lager is my beer of choice but Anchor Steam in a can that would be the best!!! You could count on me to be an even more loyal Anchor Steam customer if you start canning the Steam!!! I worked for Anchor Dist. Company for 32 years, and sold Anchor since 1971 in San Francisco. That time with Anchor was special. I think your cans look great, keep up the good work.